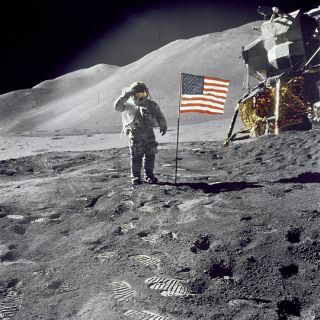 In this historical photo from the U.S. space agency, Astronaut David R. Scott, commander, gives a military salute while standing beside the deployed U.S. flag during the Apollo 15 lunar surface extravehicular activity (EVA) at the Hadley-Apennine landing site in August of 1971. The flag was deployed toward the end of EVA-2. The Lunar Module "Falcon" is partially visible on the right. Hadley Delta in the background rises approximately 4,000 meters (about 13,124 feet) above the plain. The base of the mountain is approximately 5 kilometers (about 3 statute miles) away. This photograph was taken by Astronaut James B. Irwin, Lunar Module pilot.